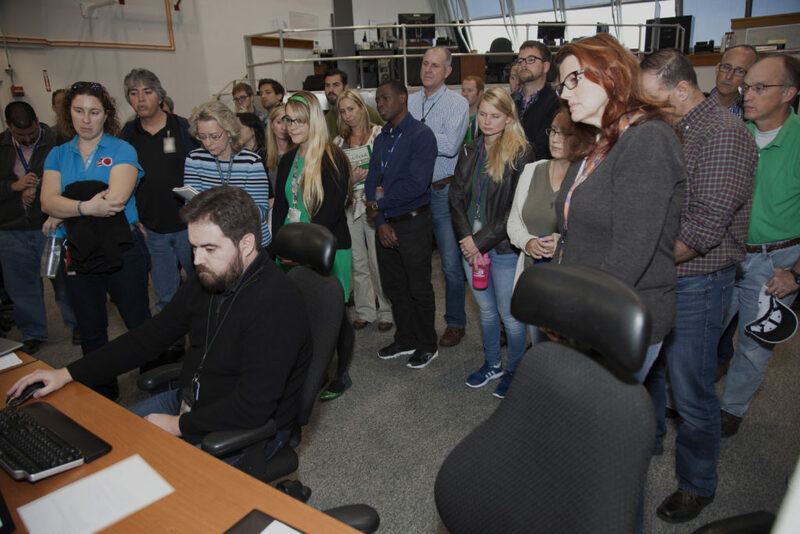 A demonstration of the automated command and control software for NASA’s Space Launch System (SLS) rocket and Orion spacecraft, recently took place in Firing Room 3 in the Launch Control Center at the agency’s Kennedy Space Center in Florida. The software, called the ground launch sequencer, will be responsible for nearly all of the launch commit criteria during the final phases of launch countdowns. The Ground and Flight Application Software Team, or GFAST, demonstrated the software for Charlie Blackwell-Thompson, launch director for the first integrated flight of the SLS and Orion spacecraft. Also attending were representatives from the NASA Test Director’s Office. The software is in the advanced stages of development. It includes nearly all of the core capabilities required to support the initial use during Ignition Over-Pressure / Sound Suppression and follow-on tests through launch of the agency’s SLS rocket and Orion spacecraft. The suppression stage ensures the water dampening system initiates in the final second of launch countdown. It also produces the pattern and volume needed to dampen the pressure waves and acoustic environment caused by the firing of the SLS core stage RS-25 engines and solid rocket motors. “We were pleased to be able to demonstrate the continued evolution of the ground launch sequencer for members of the launch team, and look forward to its first use in operations support,” said Alex Pandelos, operations project engineer for Launch Integration in the Ground Systems development and Operations Program (GSDO). The software was developed by GSDO’s Command, Control and Communications teams at the center. Development of the software will continue, with a goal of beginning verification and validation of the software in summer 2017. NASA’s crawler-transporter 2 (CT-2) took a test drive along the crawlerway at Kennedy Space Center to determine the structural dynamics and loading environments of the crawler’s recent upgrades. The test was performed to ensure that the crawler is ready to support the first integrated flight of the agency’s Orion spacecraft atop the Space Launch System. The unloaded CT-2 rolled from the crawler yard along the crawlerway to the Pad A/B split for the first leg of the trip and traveled back to the mobile launcher platform park site near the Vehicle Assembly Building. For the loaded test, the crawler picked up Mobile Launch Platform 1 at the park site and returned to the Pad A/B split. Engineers took measurements during the entire trek using accelerometers, strain gauges and pressure transducers. The data collected will be used to validate the dynamic model of the integrated SLS. CT-2 is the vehicle that will carry the SLS rocket and Orion spacecraft on the mobile launcher to Pad B for launch. The behemoth vehicle recently was upgraded to support the heavier load of the SLS atop the mobile launcher. 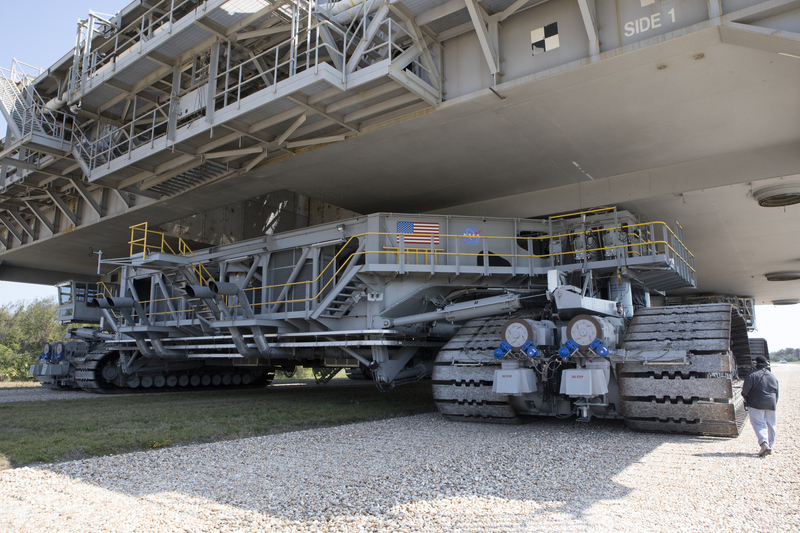 Upgrades to the crawler included installation of new generators, gear assemblies, jacking, equalizing and leveling (JEL) hydraulic cylinders, roller bearings and brakes. Other systems also were upgraded. The Ground Systems Development and Operations Program is overseeing upgrades to facilities and ground support equipment necessary to support the launch and deep space missions, including the Journey to Mars.